The perfect rug will pull a room together, giving it a finished look. 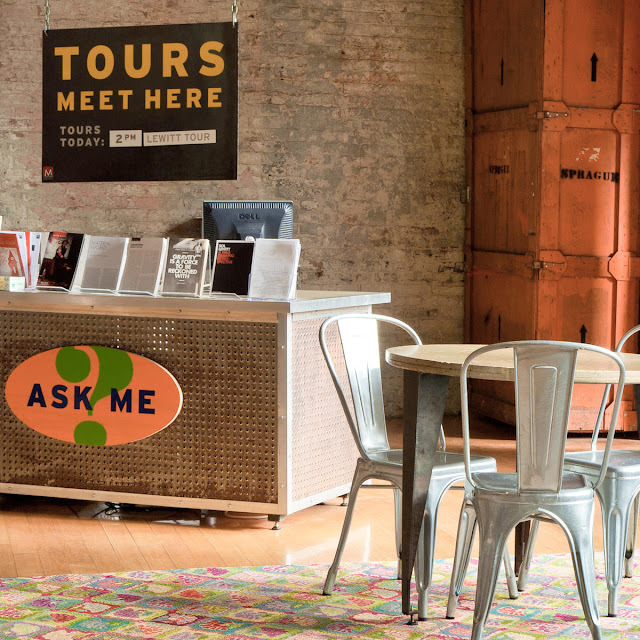 Below are some tips we use when we assist customers with selecting a rug. When choosing a rug, always start by thinking about how the room is used. Make a floor plan. Measure your space and add all the furniture you're planning to put in the space on the floor plan. Rectangular rugs look best in rectangular rooms; square rugs look best in square or rectangular rooms; and round rugs look best in foyers or under round dinning tables. Large area rugs will make a room feel larger. These area rugs visually embrace the space. When sizing an area rug, allow 12" to 18" between the edges of the rug and the perimeter of the space so that the floor frames the rug. If a large area has a space that gets a lot of traffic, block out this area and place the rug in the middle of the space that’s left over. Small accent rugs work as a focal point drawing your eye to a specific point or function. If you want an accent rug to draw your eye in, select a smaller rug and center it under a dining table, coffee table, or the main light fixture in the room. Choose the right material for the function and style of the space. High traffic areas need a flat rug that can be cleaned easily. 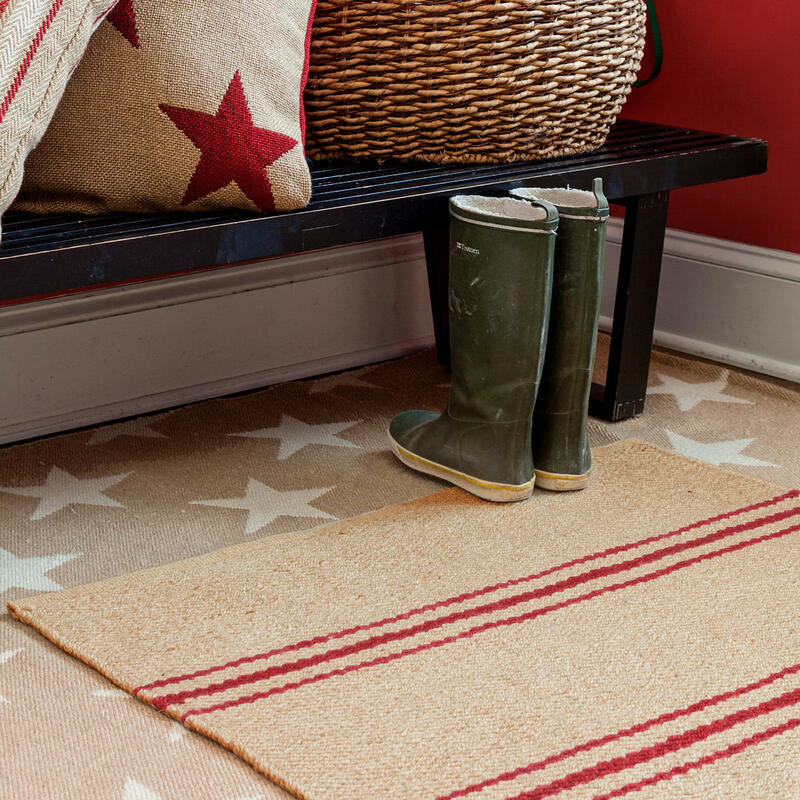 For entryways, choose a flat-weave rug to minimize tripping. 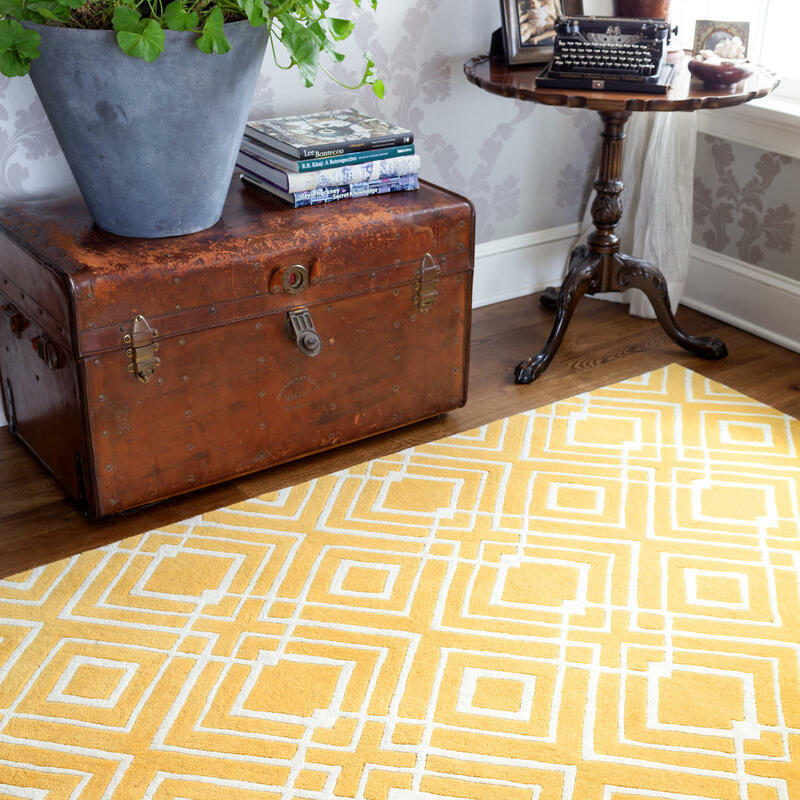 For hallways, choose a cotton or wool flat weave rug. Solid rugs are more restful to the eye, and work with either solid or patterned furniture. Choose a color that complements other accessories in the room. Look at your artwork, pillows, and decorative accesories for inspiration. Patterned rugs will energize a space, and look stunning with solid furniture. Use warm colors to to create a cozy and intimate mood. Use lighter colors to open up smaller spaces and make them feel larger. 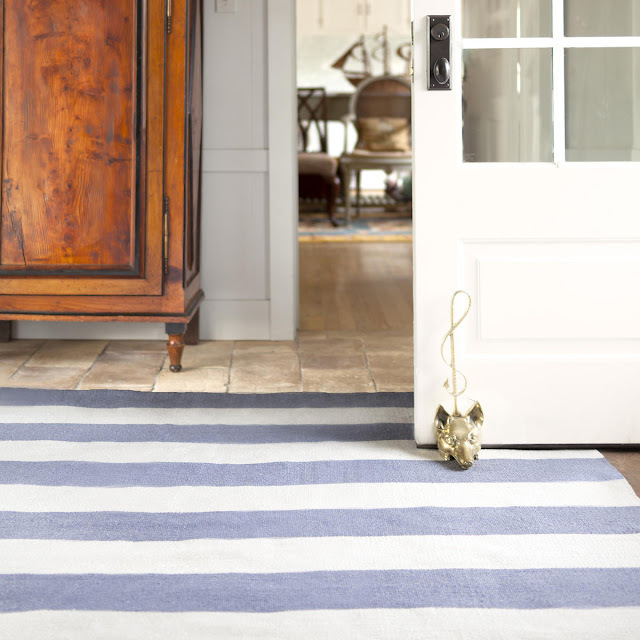 In the entryway, choose a rug that hides dirt well and is large enough to cover the width of your door. Measure your door clearance so that the rug is not so thick that it gets in the way when you open and close your door. In the foyer, rugs can be used to anchor a console table, direct your sight lines forward, or add color. For best effect, leave at least 6-12″ of bare wood exposed on all sides. 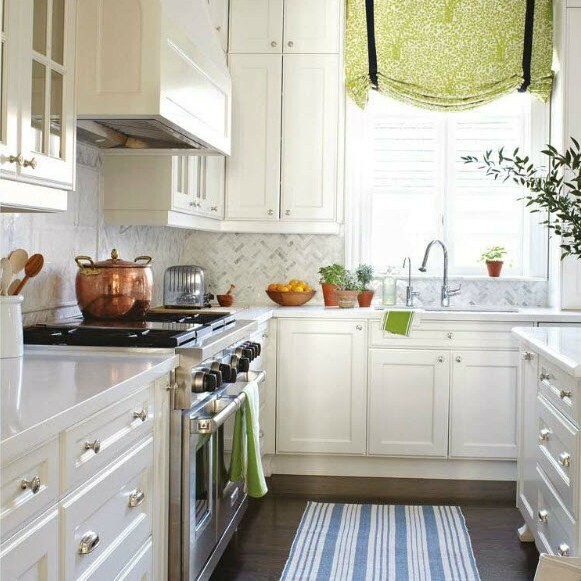 In the kitchen, use 2′ x 3′ rugs in front of the sink. In larger spaces, a 3'x5', 4'x6', or a runner can instantly warm up a room. In the dining room, a rugs should always be centered under the dining table. You should be able to pull out all the chairs and the chair legs remain on the area rug when seated. To make sure that the rug is large enough to cover chairs when they are pulled, choose one that is at least 24″ larger than your dining table on all sides. In the living room, the best rugs are ones that visually anchor seating groups. Choose a rug that is large enough to fit all four legs of your furniture pieces. If necessary, the rear legs of your sofa can be left off the rug. If possible, frame the rug buy leaving some of your floors exposed. Choose a rug that leaves a 12″ to 18″ of space between the rug and the wall. In a bedroom, place the rug completely under the bed or have it cover the bottom 2/3 of the bed. Choose a rug that is at least 24 inches wider than your bed so that you can step onto it when you get up. If you have nightstands, size the rug to end 6-12 inches beyond the edges of the nightstands. 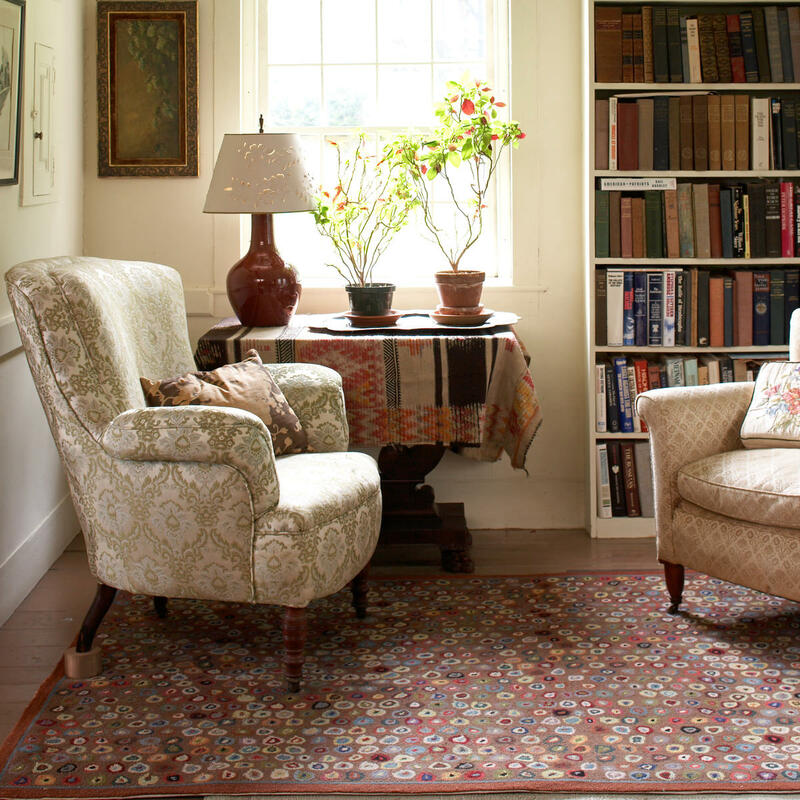 In a bedroom sitting area, you can use one smaller rug between two chairs or in front of a sofa or chaise lounge. In the bathroom, a rug is essential for stepping out of the tub or shower. Choose one that’s washable and large enough to cover the size of your shower or tub area. If you have double sinks, matching bath rugs add softness and symmetry to the room. For the moist environment of a laundry room, mud room, or outdoors, an indoor/outdoor rug is perfect. You can use them to add color and texture to each area, and they are easily cleaned. Outdoors, rugs are great for defining outside dining spaces. Using a rug pad will extend the life of your rug and help prevent it from slipping. Vacuum regularly to keep clean and rotate your rug periodically to even out wear. Trim any loose threads with scissors. If you have a spill, clean it immediately by blotting with a clean cloth or paper towel. Always test rug cleaners on an inconspicuous area before using to clean the entire rug. Professional cleaning is recommended on all wool rugs. Searching for Rugs? See our Dash & Albert Rug collection.